O God, who made your Priest Blessed Francis Xavier Seelos outstanding in love, that he might proclaim the mysteries of redemption and comfort those in affliction, grant, by his intercession, that we may work zealously for your glory and for the salvation of mankind. Through our Lord Jesus Christ, your Son, who lives and reigns with you in the unity of the Holy Spirit, one God, for ever and ever. O God, who in a wondrous manner revealed the inexhaustible riches of your mercy to Saint Maria Faustina, grant, we beseech you, that by looking with trust upon the pierced side of your Son we may be strengthened to show mercy one to another and, at length, sing forever of your mercy in heaven. Through our Lord Jesus Christ, your Son, who lives and reigns with you in the unity of the Holy Spirit, God, forever and ever. O God, who manifest your almighty power above all by pardoning and showing mercy, bestow, we pray, your grace abundantly upon us and make those hastening to attain your promises heirs to the treasures of heaven. Through our Lord Jesus Christ, your Son, who lives and reigns with you in the unity of the Holy Spirit, one God, for ever and ever. On July 25, 2014, the Congregation for Divine Worship and the Discipline of the Sacraments confirmed the inscription of Blessed Francis Xavier Seelos, Priest, into the Proper Calendar for the Dioceses of the United States of America. Born in Füssen, Germany in 1819, he entered the diocesan seminary, and, coming to know the charism of the Congregation of the Most Holy Redeemer, joined it and was sent to North America. Ordained a priest in 1844, he began his pastoral ministry in Pittsburgh, Pennsylvania as assistant pastor of his confrere Saint John Neumann, serving also as Master of Novices and dedicating himself to preaching. He became a full-time itinerant missionary preacher, preaching in both English and German in a number of different states. He died in New Orleans, Louisiana, on October 4, 1867. Newly beatified in 2000, some areas celebrate the Optional Memorial of St. Faustina Kowalska, a Polish nun who was chosen by Jesus to remind the world of the mystery of God's merciful love, the devotion to Divine Mercy. According to the 1962 Missal of St. John XXIII the Extraordinary Form of the Roman Rite, today is the commemoration of St. Placid and His Companions. St. Placid was placed in the care of St. Benedict at Subiaco by his father when quite young. There had been a group of fourth-century Sicilian martyrs of whom one had the name Placid. This Placid was erroneously identified with the disciple of St. Benedict; thus arose the legend that the monk Placid, his sister, and thirty monks suffered martyrdom in the port of Messina at the hands of pirates. Francis Xavier Seelos, one of 12 children born to Mang and Frances Schwarzenbach Seelos, entered the world on January 11, 1819, in Füssen (Bavaria, Germany). He was baptized on the same day in the parish church of Saint Mang where his father, after having been a textile merchant, would, in 1830, become the sacristan. Having completed his primary education in 1831, he expressed a desire to become a priest and, with the encouragement of his Pastor, he attended middle school at the Institute of Saint Stephen in Augsburg. Receiving his diploma in 1839, he went on to the University in Munich, Bavaria, where he completed his studies in Philosophy. He then began to study theology in preparation to enter the seminary where he was admitted on September 19, 1842. It was during this time that through his acquaintance with the missionaries of the Congregation of the Most Holy Redeemer, he came to know both the charism of the Institute, founded to evangelize the most abandoned, and its apostolic works, especially those among the immigrants in the United States of America. Moved by a profound apostolic zeal and deeply touched by the letters published in the Catholic newspaper Sion, from the Redemptorist missionaries describing the lack of spiritual care for the thousands of German speaking immigrants, Seelos decided to enter the Congregation, asking to be allowed to work as a missionary in the United States. Receiving the necessary approval on November 22, 1842, he sailed the following March 17, from the port of Le Havre, France, arriving in New York on April 20, 1843. On December 22, 1844, after having completed his theological studies and novitiate, Seelos was ordained a Priest in the Redemptorist Church of St. James in Baltimore, Maryland, U.S.A.
A few months after his ordination, he was transferred to St. Philomena's Parish in Pittsburgh, Pennsylvania, where he remained nine years. His first six years there were spent as assistant pastor with St. John Neumann, who was also the superior of the Redemptorist community. The remaining three years, Francis Seelos served as superior of that same community. It was during these years that he was appointed Master of Novices for the Redemptorists. In addition to his work as assistant pastor, Seelos, together with Neumann, dedicated himself to preaching missions. Regarding his relationship with St. John Neumann, Seelos said: "He has introduced me to the active life" and, "he has guided me as spiritual director and confessor". His availability and innate kindness in understanding and responding to the needs of the faithful, quickly made him well known as an expert confessor and spiritual director so much so that people came to him even from neighboring towns. In both Baltimore and Pittsburgh, Seelos made Confession become, rather than a torment, the locus of a life-giving experience of an encounter with Christ Patient and Merciful. His confessional was open to all: "I hear confessions in German, English, French, of Whites and of Blacks". The faithful described him as the missionary with the constant smile on his lips and a generous heart, especially towards the needy and the marginalized. It is no coincidence that in Pittsburgh, after his death, the people began to attribute to his intercession many favors received. In 1854, he was transferred from Pittsburgh, to a number of cities in the state of Maryland: Baltimore, then Cumberland in1857, and to Annapolis (1862), all the while engaged in Parish ministry. In Cumberland and Annapolis, he also served in the formation of future Redemptorists as Prefect of Students. Even in this post, he was true to his character remaining always the kind and happy pastor, always prudently attentive to the needs of his students and conscientious of their doctrinal formation. Above all, he strove to instill in these future Redemptorist missionaries the enthusiasm, the spirit of sacrifice and apostolic zeal for the spiritual and temporal welfare of the people. In 1860, His Excellency Michael O'Connor, Bishop of Pittsburgh, upon leaving his diocese, recommended Father Seelos as the Priest most qualified to succeed him. Francis Seelos wrote Pope Paul IX explaining his inadequacy to accept such a responsibility and asking " to be liberated from this calamity". He was overjoyed when another Priest was named Bishop of Pittsburgh. Following the outbreak of the Civil War in the United States, new laws were enacted in 1863 which required every able bodied male to make himself available for military duty. Seelos, as Superior of the Redemptorist seminary, traveled to Washington to meet with President Abraham Lincoln and ask him to exempt the Redemptorist seminarians from military service. Lincoln, according to Seelos himself, was not only extremely receptive of the petition, but promised to do everything in his power to bring it about. In fact, the students were exempted from going off to war. Relieved from his office as Prefect of Students because, according to a zealous confrere, he was too obliging and not severe enough with the seminarians, from 1863 to 1866 he dedicated himself to the life of an itinerant missionary preaching in English and German in the states of Connecticut, Illinois, Michigan, Missouri, New Jersey, New York, Ohio, Pennsylvania, Rhode Island and Wisconsin. After a brief period of parish ministry in Detroit, Michigan, he was assigned in 1866 to the Redemptorist community in New Orleans, Louisiana. Here also, as pastor of the of the Assumption, he was known as a pastor who was joyously available to his faithful and singularly concerned for the poorest and the most abandoned. As in other cities, his prayers were considered very powerful in obtaining favors from God. In God's plan, however, his ministry in New Orleans was destined to be brief. In the month of September, exhausted from visiting and caring for the victims of Yellow Fever, he contracted the dreaded disease. After several weeks of patiently enduring his illness, he passed on to eternal life on October 4, 1867, at the age of 48 years and 9 months. Visit the official website devoted to Bl. Francis. If you visit New Orleans be sure to stop by the Seelos Shrine. Bl. 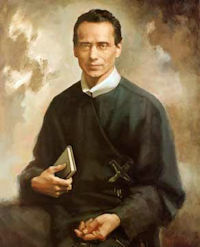 Francis X. Seelos was a Redemptorist. Visit their website to learn more. Saint Faustina was born in the 20th century, and canonized in the year 2000. Jesus chose her to deliver to the modern world a message as old as eternity. It is the message of his love for all people, especially sinners. Jesus said to Faustina, "Today I am sending you with my mercy to the people of the whole world." It is his desire to heal the aching world, to draw all people into his merciful heart of love. On February 22, 1931, Jesus appeared to Faustina as the King of Divine Mercy. He asked her to have a picture painted of him as she saw him — clothed in white, with red and white rays of light streaming from his heart. The rays represent the blood and water that flowed from the side of Jesus on the cross. Under the image are the words, "Jesus, I trust in you." Many people did not believe Faustina at first. The sisters in her own convent thought that Jesus could not possibly have selected her for this great favor. After all, she was an uneducated peasant girl. Her superiors often refused to give her permission to carry out Jesus' requests. Church theologians, too, doubted her word. Jesus told Faustina that he loved her obedience and that his will would be done in the end. In June 1934 an artist completed the painting of the Divine Mercy according to her instructions; and it soon became a focus for devotion. Faustina continued to record in her diary the appearances of Jesus. The diary was translated into English and published in 1987 with the title Divine Mercy in My Soul. Faustina, baptized Helena, had grown up in a poor Polish family of 10 children. When she was 15 years old, she quit school in order to work as a housemaid to help support her family. By the time she was 18, she was sure that God was calling her to a religious life, but her parents objected. So she tried to put it out of her mind. But one night, while the lively polka music was playing at a village dance, Helena saw Jesus, sad and suffering. The very next day she packed a small bag and went to the capital city of Warsaw to join the Sisters of Our Lady of Mercy. There she received the name Sister Mary Faustina. About 10 years later, Faustina contracted tuberculosis. Soon she was too weak to manage the heavy gardening assigned to her. So she was given the job of gatekeeper. She was able to show mercy to the poor people who came to the convent looking for food. Once Jesus came to the door as a poor young man. After he had eaten the soup and bread Faustina gave him, she recognized him. Jesus told her he had come to experience with great joy her tender love and mercy. Faustina was canonized by the first Polish pope, John Paul II, on April 30, 2000. The first Sunday after Easter was declared Divine Mercy Sunday. Excerpted from Saints and Feast Days: A Resource and Activity Book by The Sisters of Notre Dame of Chardon, Ohio. Symbols: young nun in habit; nun with vision of Jesus, with two streams of light, one red and white (Divine Mercy image). Read a short biography of Sr. Mary Faustina Kowalska from the Vatican. Read the Holy Father's April 30, 2000 Homily at the solemn Mass celebrated for the canonization of Sr. Mary Faustina Kowalska. In connection with the octave of Easter, recent years have witnessed the development and diffusion of a special devotion to the Divine Mercy based on the writings of Sr. Faustina Kowalska who was canonized 30 April 2000. It concentrates on the mercy poured forth in Christ's death and resurrection, fount of the Holy Spirit who forgives sins and restores joy at having been redeemed. Since the liturgy of the Second Sunday of Easter or Divine Mercy Sunday — as it is now called — is the natural locus in which to express man's acceptance of the Redeemer's mercy, the faithful should be taught to understand this devotion in the light of the liturgical celebrations of these Easter days. Indeed, "the paschal Christ is the definitive incarnation of mercy, his living sign which is both historico-salvific and eschatological. At the same time, the Easter liturgy places the words of the psalm on our lips: "I shall sing forever of the Lord's mercy" (Ps 89: 2). St. Faustina came from Poland. John Paul II was also Polish, and had a great devotion to the Divine Mercy. He made it a feast day on the second Sunday after Easter. Find out more about Poland and its customs. It's a very Catholic country, with deep devotion to Our Lady. A wonderful book that gives a wonderful understanding of the culture is the Pope's biography A Witness to Hope by George Wiegel. This site contains many Polish Traditions. The Polish Art Center has many resources for Polish customs. Try your hand at a Polish dish or two. Perhaps practice making some of the favorite foods for the Polish Wigilia (Christmas Eve Dinner) Pierogi (or Pirohi) is one of the most popular Polish foods, but do some research to find other recipes. "What followed was remarkable indeed, and unheard of since the time of Peter the apostle! Maurus asked for the blessing and on receiving it hurried out to fulfill his abbot's command. He kept on running even over the water till he reached the place where Placid was drifting along helplessly. Pulling him up by the hair, Maurus rushed back to shore, still under the impression that he was on dry land. It was only when he set foot on the ground that he came to himself and looking back realized that he had been running on the surface of the water. Overcome with fear and amazement at a deed he would never have thought possible, he returned to his abbot and told him what had taken place. —Excerpted from The Church's Year of Grace, Pius Parsch. Symbols: Tongue and knife; crescent; sword.